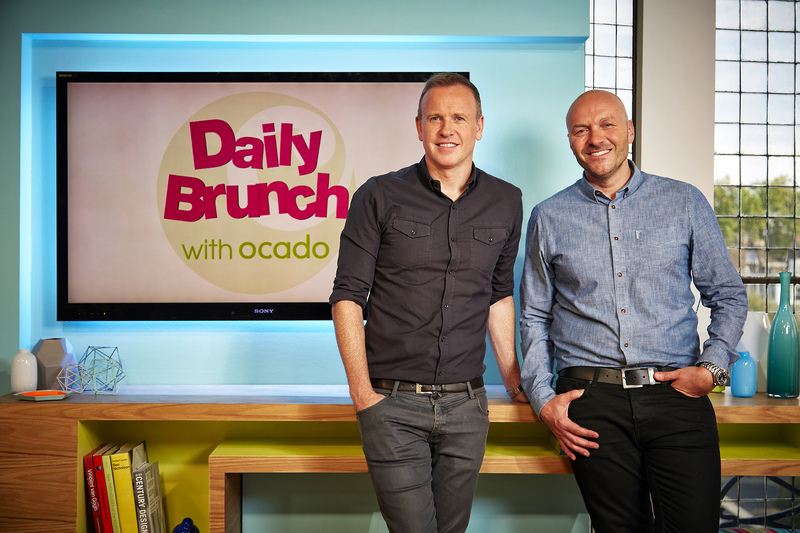 We’ve kicked off the week with the first ever episode of Daily Brunch with Ocado – hope you enjoyed watching! Simon’s Cauliflower Cheese Shepherd’s Pie is both seasonal and sumptuous. Cauliflower is an incredibly versatile vegetable, in season from August until December. Adding cauliflower cheese to this shepherd’s pie makes it more luxurious and is a surreptitious way to include more vegetables in a delicious family dinner. Heat half of the oil in a large heavy-based frying pan over a high heat. Add the mince and fry until browned all over. Remove with a slotted spoon. Add the remaining oil to the pan and gently fry the onion, carrot and garlic for eight minutes, or until the vegetables have softened. Add the stock and madeira, bring the mixture to the boil, then reduce the heat and simmer for 40 minutes. Stir in the parsley, remove from the heat and set aside to cool. Blanch the cauliflower florets for one minute. Drain, refresh in iced water and pat dry. Beat together the crème frâiche, mustard, egg and cheese in a bowl. Fold in the cauliflower. 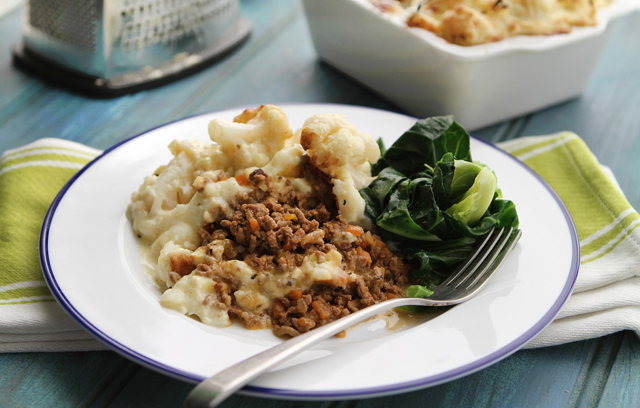 Spoon the mince into the baking dish and top with the mashed potato, then spoon over the cauliflower mixture and bake in the oven for 20 minutes. Preheat the grill to high, then grill the pie until the top is golden-brown and bubbling around the edges. 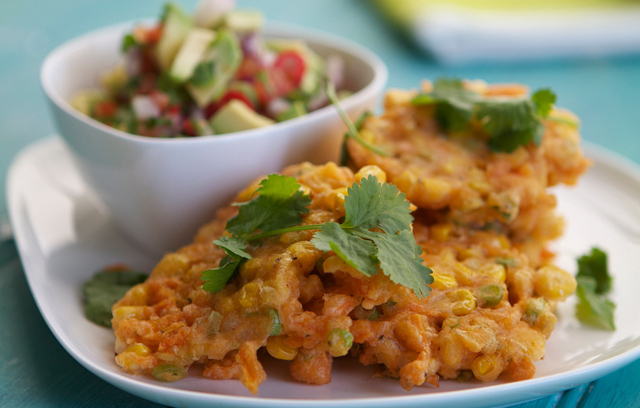 These sweet and fluffy fritters make a delicious light lunch or dinnertime starter, when served with the fresh Mexican-inspired salsa. They are quick and easy to make, and include lots of nutritious vegetables. For the fritters, mix the flour, paprika, sugar, baking powder, salt and freshly ground black pepper together in a bowl. In a separate bowl, beat the eggs and milk together. Gradually add the egg and milk mixture to the dry ingredients and combine to form a batter. Don’t overwork the mixture. Place the sweetcorn kernels, carrot and spring onions into a separate bowl and add just enough batter to the mix to bind them. Heat the oil in a frying pan, and drop in a good spoonful of the mix. Cook for two minutes on each side, drain on kitchen paper and keep warm until all the batter is used up. To make the salsa, mix together the tomatoes, avocado, red onion, lime, chilli, coriander and olive oil. Season to taste. Serve the fritters with tomato salsa on the side. This entry was posted in Daily Brunch, Talking Ocado and tagged Channel 4, Cook, cooking from scratch, Daily Brunch, food, foodie, good food, Groceries, home cooking, Ocado, Ocado deliveries, Ocado groceries, ocado.com, Recipes, Shopping at Ocado, Simon Rimmer, Tim Lovejoy by Ocado. Bookmark the permalink. If you do a review, like the meatballs, why can’t you follow it up with a wonderful meatball recipe. It was disappointing to see the recipe was sweet corn fritters after raving about the meatballs.